I was recently interviewed on why posture is important and had an article published in Good Health magazine on what the top 3 gym exercises are to help improve posture. Increasing evidence suggests poor posture can lead to increase stress on tissues, muscle imbalances and musculoskeletal pain. Posture, particularly maintaining a good sitting posture is becoming more and more important in a society that spends most of its day sitting in front of screens. So why is exercise so important? Whilst we all have good intentions and try to sit in an improved posture it is not long before we find ourselves in a slumped position. Often this is because we don’t have either the muscle strength or length to maintain this position for long periods. Exercises that address these muscles are the key to improving your posture and preventing unwanted pain. 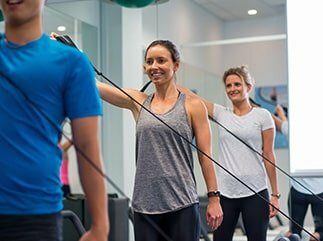 Using either gym equipment or a resistance band secured in front of you start with both arms in front of your body at shoulder width with palms facing downwards. Pull the weighted handles or the resistance band towards you. Keep your chest upright and bring your elbows behind you squeezing between your shoulder blades at the same time. Lie on your back with your knees bent and feet on the ground close to your bottom. Push through your heels and lift your bottom off the ground. Try and keep your back in a neutral position, squeeze your buttock muscles and lift your hips. Add weights on top of your hips to make it harder once you have the action sorted. Aim: To strengthen the muscles that help to pull your shoulder down and back thus preventing rounded shoulders. 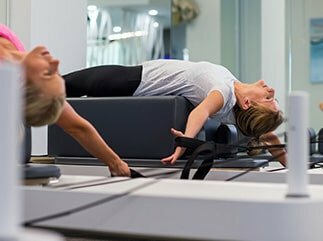 Expert opinion: Exercises to strengthen the muscles at the back of the body, also known as our posterior chain or anti-gravity muscles, are the best defence in the gym to prevent poor posture. If you have any queries regarding your posture SquareOne Physiotherapists are experts in assessing posture and developing exercise programs both within the gym setting and out to correct problems identified. And if you’re keen for more… check out the current Good Health magazine in stores now.